March 3, 2019, 6:30 P.M. - 9:30 P.M.
What: Sound of Awakening, a music trio that creates a healing vibration through music. 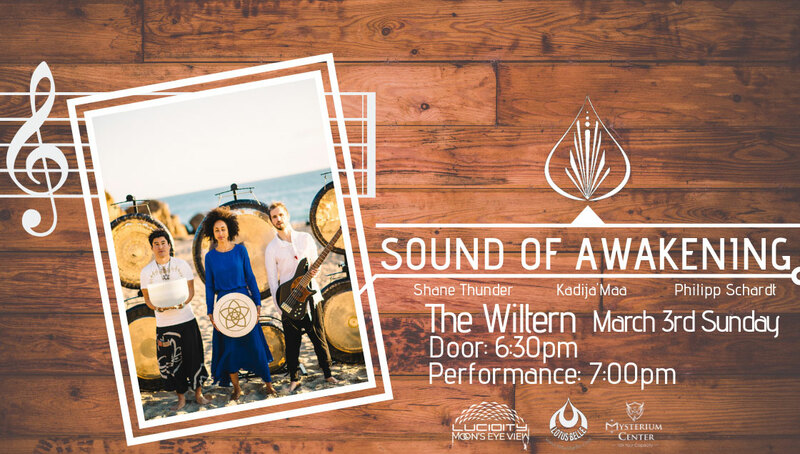 On Sunday, March 3rd from 6:30pm-9: 30 pm, The Wiltern will begin a new chapter in its 90 year history as they host "Sound of Awakening" for the venues' first ever sound meditation experience & creating one of Lucidity Festival's Moon Eye View pre-celebration event. The growing popularity of this type of musical meditation movement has erupted all over the world in the past decade. It has attracted a widely diverse set of fans & attendees seeking sounds & vibrations that relax, calm & rejuvenate the mind, body, and spirit. "Sound of Awakening" is a co-creative blend of modern-day contemporary music & the sacred art of healing through vibration. This trio of world-talented artists, known as Shane Thunder, Kadija'Maa (Kady Taylor), and Philipp Schardt (TempleMind), weave a masterpiece of intuitive soundscapes that blur the dimensions between modern musical scores, live performance vocals, & deep meditative tones. Having released several EPs and their iconic "Oceanic" album in 2018, these musicians share a theatrical experience meant for every type of audience!